The Musical Instrument Museum would be easy to miss on a first trip to Berlin. But all that are interested in classical music (especially keyboard) or fine cabinetmaking should consider making a stop here. At one end is a tracker pipe organ with clear plastic walls surrounding the works. 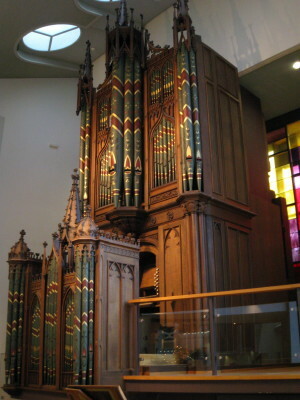 (A tracker organ is one in which there is a direct mechanical connection between the keys and the valves of the pipes, allowing more sensitive playing than the later electro-mechanical assemblies in pipe organs of the last century.) The plastic walls (opposite to side shown) permit one to view the mechanic in action. This organ was built by William and John Gray, Englishmen. Though early-nineteenth century, they preserved the Baroque voicing of the organ tradition. One should be so lucky as to happen upon the museum while Mr. Klaus Pandrick is on duty. 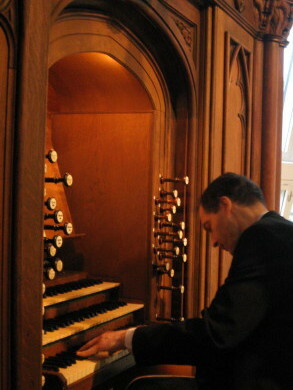 Shown here is Herr Pandrick demonstrating the Gray organ. He also played a number of harpsichords, virginals, chamber organs, and various other keyboard instruments. Quite frankly, his solicitousness instantly bridged the gap of continents and language (the special vocabulary of musical instruments put my German in the dust compared to his English; so English it was) and became a highlight of my tour of Berlin. Several keyboard instruments predated the modern piano. 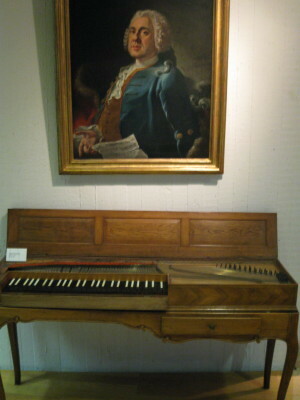 The clavichord, which looks like a small table outfitted with keyboard, works by a device that lands on the string and remains sitting there. This allows a player to actually use vibrato (Bebung) by wiggling the key as it is held down with a finger, similar to how acoustic guitar players achieve the effect. This one is probably a late clavichord, perhaps the sort that CPE Bach might have played: it has a wide range of 4 1/2 octaves, or 56 notes, suggesting the tail end of the history. It also is made to look like a piece of furniture, unlike earlier instruments, which were of rougher construction. Notice that there are nowhere near 56 tuning pins on the right side, which would mean that there are several notes assigned to each string; whereas a virginal would have one string per note. 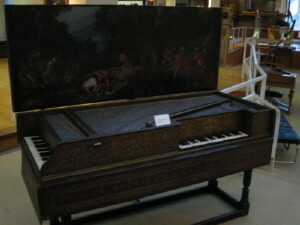 The harpsichord sets the strings vibrating by a mechanism that plucks the string in response to a key being depressed. 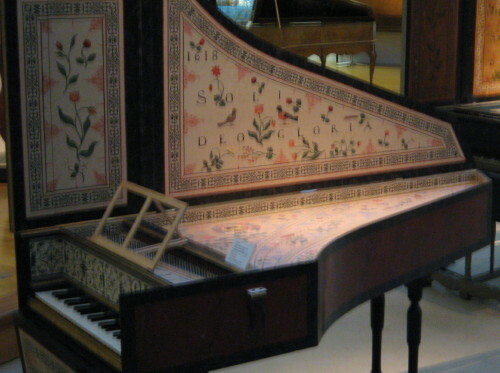 Note the “soli deo gloria” painted into the flyleaf of this harpsichord (above). Many early keyboards were built by pious Dutch Reformed and other Protestants. The double- keyboard instrument shown to left here is not standard enough to have its own name. One keyboard is a harpsichord; the one on the right is evidently a virginal. I would judge the cabinet work of this particular creation a failure. The legging is weak — both inadequate in the feel of strength compared to the ponderous cabinet above, and the need for spreaders is usually a defect in my opinion. The cabinet itself is heavy and boxy; but what could they do? I guess, given that I needed two keyboards in a small chamber, I would accept it, however reluctantly. 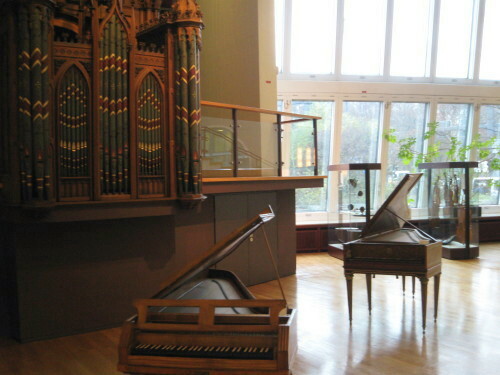 The Hammerflügel (below, in foreground, in front of organ) is an early wing-shaped precursor to the modern piano; note similarity to the shape of the later grand piano. The museum also has strings, winds, and brass, but I focussed chiefly on the keyboards on this visit. It is near the home of the mighty Berlin Philharmonic, near the train stop Potsdamer Platz, and can be conveniently combined with a stop at the St Matthew church (Matthäuskirche). Note how the Germans, during “advent” season, are incapable of not having a Christmas tree in every nook and cranny. Downstairs is a nice little cafeteria, so that the lunch problem can be solved as part of the same excursion. This entry was posted in Music, Travelogue by TJH. Bookmark the permalink.